Bertoia was born in Udine, Italy, in 1915. At the age of fifteen, his family moved to Canada and then on to Michigan. In 1932 Harry Bertoia was awarded a scholarship to Cass Technical High School in Detroit, where he studied painting and sculpture until 1936. Then he spent a year at the art school maintained by the Detroit Society of Arts and Crafts. In 1939 he was awarded another scholarship, this time for the Cranbrook Academy of Art in Bloomfield Hills, Michigan, which had been founded by Eliel Saarinen in 1932. Harry Bertoia began to teach there in 1939, establishing a workshop for metalwork. Material shortages during the second world war forced the Cranbrook Academy to close its doors in 1943. At Cranbrook, Harry Bertoia met Charles Eames. In 1943 Harry Bertoia went to California, where he worked briefly with Charles and Ray Eames for the Evans Product Company, designing furniture made of bent laminated wood. In 1943 Harry Bertoia also showed jewelry of his own design in New York. In 1946 Harry Bertoia became an American citizen. In the 1940s Harry Bertoia concentrated entirely on furniture-making; in 1950 he founded a business of his own in Bally, Pennsylvania. That same year, 1950, saw the beginning of Harry Bertoia’s collaboration with Florence and Hans Knoll, whose acquaintance he had also made at Cranbrook Academy. Harry Bertoia’s first chair design for Knoll, the “Model 420 Diamond” (1950-1952), featuring moulded mesh of chromium-plated steel wire, was an immediate bestseller. 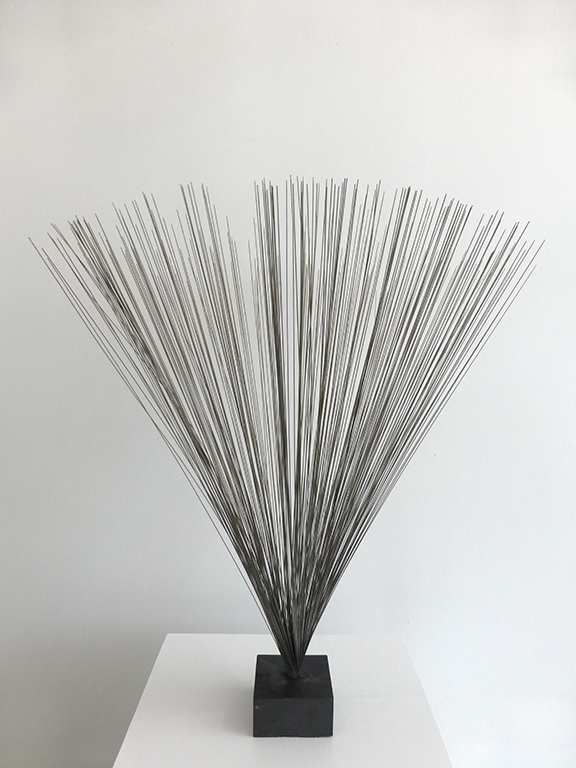 Harry Bertoia earned enough royalties from it to be able to devote himself almost exclusively to sculpture from then on. 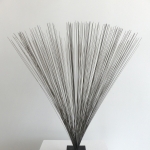 Harry Bertoia made free-standing metal objects and metal sound sculptures. The original “Diamond” chair of moulded and welded steel wire is still being manufactured and marketed by Knoll. Nowadays slightly modified variants are also sold, such as the “Model 421″ with a seat cushion but otherwise the model has remained unchanged.